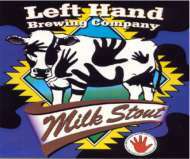 Left Hand's stout pours a dark brown, murky body with an average, fizzy light-brown head. Fair lacing behind a fully diminishing body. Aroma is of toasted/roasted coffee malts and medicine. Initial taste is moderately sweet, giving way to a light bitter finish with an average duration. Light to medium on the mouth, it has a watery texture not wanted in a stout, with soft carbonation. Yummy aroma, very satisfying finish, but not true to the style. Reviewed on October 27th, 2006.